R2D2 is Luke Skywalker's best pal; everyone's favourite little plucky droid! He fearlessly helps the Rebel cause against the empire with his robotic skills. There's only one problem with this synopsis: R2D2 isn't a robot at all: there's actually more evidence that he is just an empty shell with a tiny man trapped inside. With the droid uprising during the Clone Wars, it is no great stretch to believe that droids were hated and distrusted in the Republic, and later, Empire. But droids gave great economic benefits in cheap labour. The solution was simple: imprison men inside droid costumes to create a new underclass of slave labour with the veneer of respectability. As an added bonus, the guilt over such immortal actions would be lessened as people would look not at the face of an enslaved man, but at a blank robot face. Why are so many droids during the Empire period large and bulky, big enough to fit people rather than the thin, lithe versions of the Republic-era? Why does Jabba's palace have a droid torture chamber if droids are just mindless robots unable to feel pain? The only possible answer is that after robots were banned due to the Clone Wars, innocent people were enslaved inside bulky droid costumes. R2D2 is large enough to fit a small human inside. His beeping has no logical basis, almost as if he is a human making beeping noises in an attempt to sound like a robot. Luke Skywalker can somehow understand this illogical bleeping - is it more likely that Luke can understand random gibberish, or could he let the man inside out for brief periods between aired scenes to discuss events. Does this mean that Luke Skywalker is not an ignorant bystander, but instead culpable in this terrible galactic slavery ring? At the start of 'A New Hope', R2D2 somehow gets behind a massive wall of rocks, the hole in it far too small for him to enter with his tiny droid legs. It would have been simple for a small man to crawl out of him and maneuver him into this hole though! 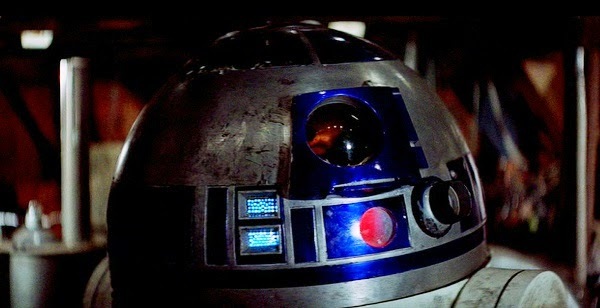 Most damningly, it is possible to see the man trapped inside R2D2. In 'A New Hope' as R2D2 is captured by the Jawas, he swings his head around, giving us a terrifying glimpse of the face of a tiny man imprisoned inside the R2D2 casing, forever forced to do the bidding of his cruel masters.